When Did Prom Become Red Carpet? Progress is a funny thing. Almost imperceptible until its effects overwhelmingly surround us. So when did the red carpet become prom? When did a high school dance (mind you, the last one) turn into the arrival entrance to the Academy Awards? It happened suddenly, and we owe it to several factors. The first, is the Academy Awards itself and how this night of glamour and fashion among stars has inspired young people. The second, is technology, or to be specific, the social media platforms that naturally progressed after the onset of the internet. And lastly, how both these factors combined made it possible for CeremonialSupplies.com to become the best online store on the web to offer the most exquisite event carpet runners, in the most dazzling shades of blue, green, purple, pink, black, and the glorious crimson pathway of the gods, so that young gods and goddesses everywhere basked in the celebration of Prom Night! The Academy Awards was the original innovator of the red carpet entrance, and later of the step and repeat banner. Before surfacing in the prom scene, the red carpet event runner was pretty much restricted to the Oscars, and even then not until the last decade did it become its own pre-presentation event as live and television audiences were treated to the lavish parade of movie stars and celebrities wearing gowns by the best known haute couture designer houses. Most American kids grow up exposed to this television landmark event, and many of them are inspired by these richly glamorous presentations. The natural progression was that as teenagers, their last high school dance would be motivated by the same sophistication and glamour projected by the red carpet arrival of celebrities at the Academy Awards. 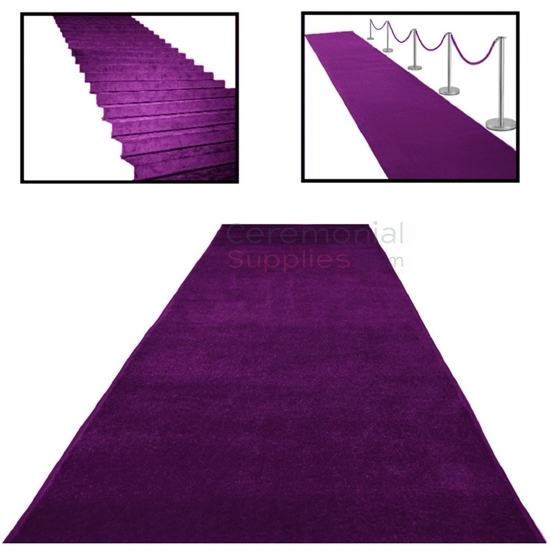 CeremonialSupplies.com is a big fan of films and film premieres, and our selection of event carpet runners, in the most brilliant shades, and red carpet accessories like classic stanchions and rope, step and repeat, and personalized ribbon banners have been all selected with the same care and attention to detail as if we were throwing the red carpet at the Oscars ourselves. As a matter of fact, we carry all the necessary supplies for a red carpet event of the same sophistication and stature! We mentioned technology and the internet and maybe you're thinking, huh? What does technology have to do with prom? Or with red carpet aisle runners? And if you are, you probably don't have an Instagram account! With the rapid communication and sharing the internet provides, all across the world, young, app savvy high school seniors with smartphones have been posting prom photos at least, since 2012 - that's 7 years. This has opened the door for prom competition. What high school prom is best? Which one has the most lavish arrival red carpet? Or the best band, best decorations, best theme? We congratulate all the graduating seniors who will be working hard to best all the other high schools in the nation for the best prom but remember, it's going to be tough to beat a White House Prom! As the stakes were upped, event carpet runners jumped to hot demand during prom season. And not just the traditional red carpet, either! This is where CeremonialSupplies.com comes in. Manufacturing industry experience, a professional eye for quality, and a genuine love for what we do - after all, who doesn't enjoy a great celebration? 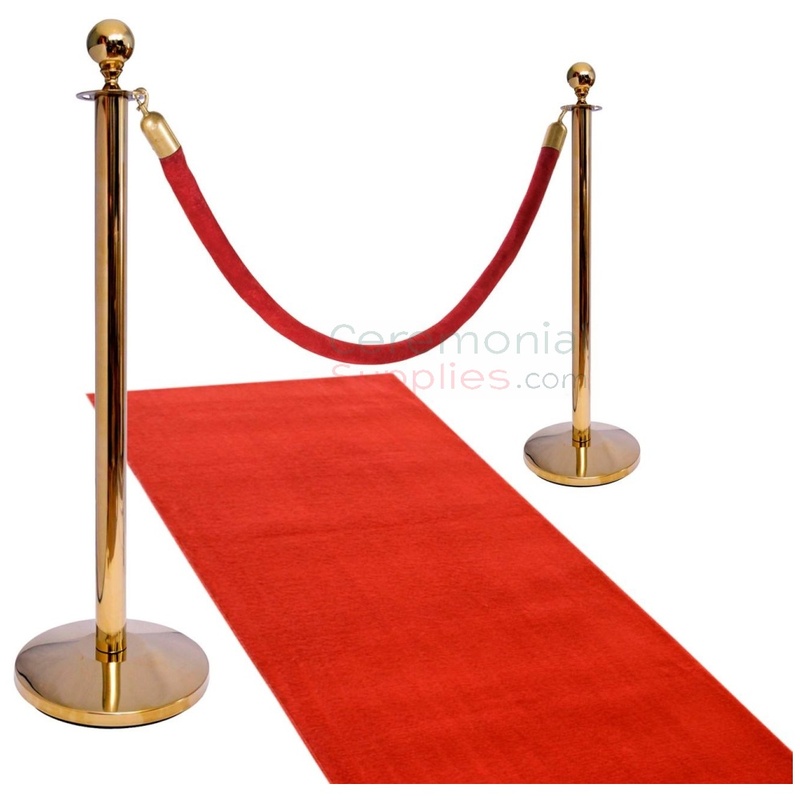 - makes us the best online store on the web to get the highest quality event carpet runners: prom red carpet, or blue aisle runner, green and black aisle carpet runners, and even pink event carpet, stanchions and rope, we even have complete, ready to go Ceremonial Red Carpet kits that bring a red carpet aisle runner with stanchions and rope for an instant set up; step and repeat, customized banners, personalized ribbons, and all the products and supplies needed for an event to look as lavish and sophisticated as a royal coronation! All at fair and budget friendly prices that won't break the bank, and with prompt and efficient shipping to your doorstep, wherever you live in the world. And, have you experienced our customer service? Attentive, knowledgeable, and pleasant. Find our for yourself and give us a call 877-373-4273 or click here for shipping quotes.